I know, it is a lot but still you need all of this to make a great lasagna! How do we work all together? No panic, it is easy! In a pan, let’s cook the sausage, the ground beef, the onion, and the garlic over medium heat until well browned. Stir in the right amount of crushed tomatoes, tomato paste, tomato sauce, and water. Do not forget to season the sauce with sugar, basil, fennel seeds, Italian seasoning, 1 tablespoon salt, pepper, 2 tablespoons parsley. Cover for about 1 hour. Boil the water and cook the dried lasagna slices in the boiling water for 8- 10 minutes. Drain it, and rinse it with cold water. In a mixing bowl, put togheter ricotta cheese with egg, the remaining parsley, and 1/2 teaspoon salt. Take a baking dish or pan and put first a cup of sacue, then put 4-6 lasagna slices lengthwise over the meat sauce. Spread on it one half of the ricotta cheese mixture and top with a third of mozzarella cheese. Again you will need to put a cup of meat sauce over the mozzarella with ca. 1/4 cup Parmesan cheese. Put on the lasagna layers (again 4 to 6, depending on the lenght of your baking dish), and top it all with the remaining mozzarella and some Parmesan cheese. Do another layer if possible; otherwise cover with some foil. Preheat the oven to 375 degrees F (ca. 190 degrees C). 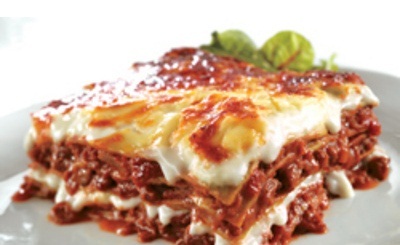 Bake your fantastic lasagna for 25 minutes. Remove the foil, and bake it for 25 minutes more. Cool about 20 minutes before serving and then…enjoy with a fantastic red wine from Umbria, Tuscany or Abruzzo (we love Montepulciano d’Abruzzo and we feel we can advice you this wine!). This entry was posted on Monday, April 2nd, 2012 at 4:59 pm	and is filed under Italian Recipes and Food. You can follow any responses to this entry through the RSS 2.0 feed. You can leave a response, or trackback from your own site.